1. All the ingredients for mayonnaise must be at room temperature. If the yolks are too cold the mayonnaise will not emulsify. If the oil is too cool, heat the bowl or the oil just to tepid. On a cold day, warm the bowl. 2. In a small bowl, beat the egg yolks with a little salt, pepper, 1 tablespoon of vinegar (or lemon juice). Add the oil, drop by drop, whisking constantly. Note: if oil is added too quickly the mayonnaise will curdle. When 2 tablespoons of oil have been added, the mixture should be very thick. The remaining oil can be added a little more quickly, either 1 tablespoon at a time and beaten thoroughly between each addition until it is absorbed, or in a thin steady stream if using an electric blender. 3. When all the oil has been added, stir in the remaining vinegar or lemon juice to taste, more mustard (if used), and salt and white pepper as needed. The amount of seasoning depends very much on the oil and vinegar used and what the mayonnaise is to accompany. Thin the mayonnaise, if necessary, with a little warm water. Mayonnaise is best stored in a covered container at room temperature, but if it is kept in the refrigerator, it should be brought to room temperature before stirring; otherwise it may curdle. It can be kept 2-3 days. Note: If mayonnaise does curdle during making or on standing, beat in a tablespoon of boiling water. 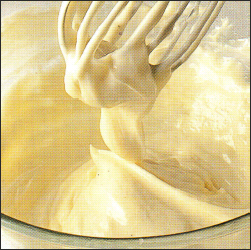 If it does not re-emulsify, start again beating a fresh egg yolk with salt and pepper, then whisking in the curdled mixture drop by drop. 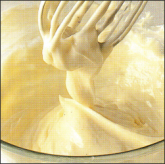 Alternatively, if the mayonnaise is to be flavored with mustard, the curdled mixture can be gradually beaten into a teaspoonful of Dijon-style mustard. An immersive hand-held blender(stick) is the best. Through the years, I have never had the mayo turn “soupy”. Add yolks, s&p, vinegar/lemon, and mustard. “Cup” yolks with stick, pour in oil, turn blender on high, and begin to slowly raise it up and down, incorporating more oil each time. Within 10 to 20 seconds, mayo is done. Taste, and adjust seasonings. I add garlic powder or roasted garlic with a chile in adobo sauce for some kick. Excellent!